Home » india news » #RohithSuicide: did RSS veto Modi's decision to sack Bandaru Dattatreya? 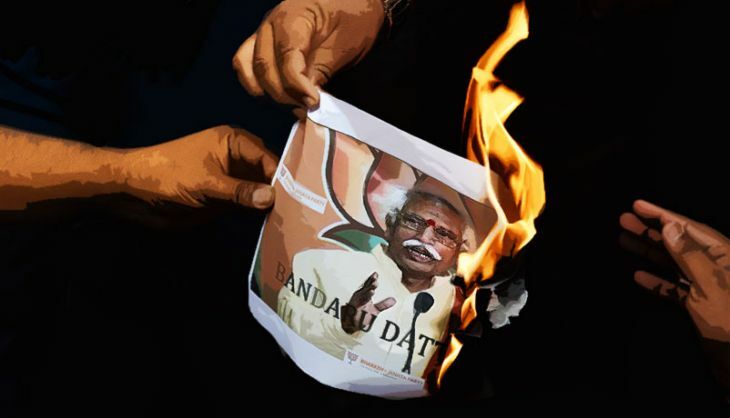 #RohithSuicide: did RSS veto Modi's decision to sack Bandaru Dattatreya? Bandaru Dattatreya is accused of abetting Rohith Vemula's suicide. Did the RSS stop his sacking? The controversy over Rohith Vemula's suicide seems to pitted the Narendra Modi regime against the RSS, its ideological fount. The fight is over the fate of Union Labour Minister Bandaru Dattatreya. Students at the University of Hyderabad as well as Dalit groups believe that Dattatreya's interference was responsible, at least partly, for the tragic death of the young scholar. Also read - What killed Hyderabad university Dalit scholar Rohith Vemula? Dattatreya had written to HRD Minister Smriti Irani demanding action against activists of the Ambedkar Students' Union, including Rohith for allegedly beating up an ABVP leader. And Dalit activists allege that Rohith and four other students were suspended only at the behest of the minister. The police have even registered a case of abetment to suicide against Dattatreya. Sources in the PMO claim that Modi wanted to save his government from further embarrassment by asking Dattatreya to resign. Such a move would have established the government's pro-Dalit credentials, or so the thinking went, while nipping the entire controversy in the bud. And the BJP really can't afford to be seen as anti-Dalit. The party has been going all out to claim the legacy of BR Ambedkar, in a clear attempt to woo Dalit voters. The BJP has termed Ambedkar the greatest leader of India's freedom movement. The Modi regime commemorated his 125th birth anniversary as Constitution Day, and convened a special parliament session to mark the occasion. It has also announced setting up of Ambedkar International Center at 15, Janpath at a cost of Rs 197 crore, while the BJP government in Maharashtra has spent 4 million British pounds to buy a bungalow in London in which Ambedkar had once lived. On 22 January, Modi became the first prime minister to visit the Ambedkar Mahasabha premises in Lucknow. He garlanded the urn containing his ashes. The state unit of the BJP even came to the event with pamphlets showcasing the work undertaken by the Modi government for "safeguarding Ambedkar's legacy". Also, Modi reportedly felt Dattatreya's resignation was necessary since the BJP's allies such as the LJP were demanding an independent probe into the suicide. In fact, even the party's own leader Sanjay Paswan had asked for a probe into the entire incident. The BJP is contesting elections in crucial states such as West Bengal, Kerala and Tamil Nadu in the coming months. And the Dalit vote is a deciding factor in many parts of these states. The BJP fears its rivals will use Rohith's death to portray it as an anti-Dalit party. Keeping Dattatreya on as minister, thus, could harm the party's prospects. Modi is particularly worried about the impact of this episode on the 2017 Uttar Pradesh election. No party can afford to ignore the Dalit voters in what is India's politically most important state. Moreover, the controversy could overshadow the parliament budget session, something the government just can't afford. The last two sessions have been lost owing to various issues, and another wasted session could seriously dent Modi's credibility in pursuing his ambitious economic agenda. The prime minister is banking on the coming session to pass key economic legislations such as the GST Bill, and thereby show his critics that he means business. Dattatreya's resignation could preempt the opposition's attack on the government as anti-Dalit, and ensure smooth running of the house. The RSS, however, isn't impressed. The Sangh brass, sources said, has made it clear to Modi that it wants Dattatreya to stay. It seems to have other considerations in mind. The RSS leaders believe that Hyderabad Central University as well as the Osmania University have been bastions of militant left movements for far too long. To counter them, they believe, it's necessary to strength the ABVP. The RSS brass, in fact, seem to believe that the current agitation in the University of Hyderabad is aimed more against the ABVP than ensuring justice for Rohith. And Dattatreya's resignation, they feel, would harm not only the ABVP but Swayamsevaks of Hyderabad as well. As per RSS' calculations, the current agitation would die down after some time just as the protest of FTII students against the appointment of Gajendra Chauhan as chairman had fizzled out. So, the Sangh leaders believe, there is no need to make a scapegoat of a "committed leader like Dattatreya". Dattatreya does indeed have strong credentials as far as the Sangh Parivar is concerned. Coming from the backward Kurma caste in Telangana, he served for years in the RSS before joining the BJP. His stint as the RSS pracharak ended after he got married. He shifted to the BJP and became secretary of its Andhra Pradesh unit in 1980, and president in 1996. He went on to become a four-time MP from Secunderabad and served as a minister in the Atal Bihari Vajpayee government. He is credited with building the party in Andhra Pradesh and Telangana at a time when the BJP had few takers there. According to sources, Dattatreya was "specially recommended" by the RSS for a ministerial berth in the Modi government. This despite the fact that he did not initially find a place in Modi's choice of ministers. Currently, he is also the party's national vice president and chairman of its OBC welfare committee. #HydStudentSuicide: here's how you got your "facts" totally wrong, Ms Irani!